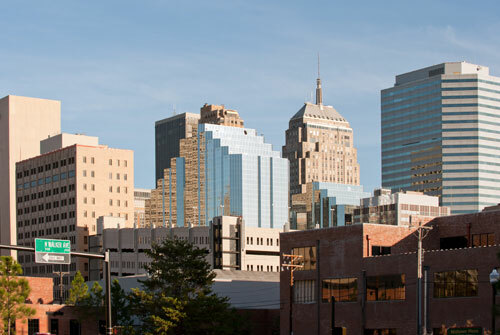 Oklahoma City is one of our original hometowns, dating back to the early 1970's. With the city's resilient and robust economy, Oklahoma City's industrial economic base has been strong. From the military presence at Tinker Air Force Base, to the thriving distribution centers of the I-35 corridor, to manufacturing operations that range from energy industry to automotive. We have assisted hundreds of Oklahoma companies in their quest to optimize their operations to be faster, more efficient, more accurate, and safer. Cisco-Eagle has helped many Oklahoma City companies with finding the right conveyor solutions. We can help you, too. Storage is almost as important as manufacturing. Being able to build up inventory in an organized manner and making it convenient for loading and unloading is critical. Cisco-Eagle helps solve those problems and provides you highly productive storage. Cisco-Eagle service and maintenance work keeps your equipment up and running at peak performance. Choose an annual maintenance agreement or just call us when we're going to be needed. We'll be there. Bring automation into your facility and free up workers for more important functions. Replace tedious, repetitive and hazardous jobs with automated equipment or robotics to improve production speed, safety, and quality. Put materials right where you need them to be with lift equipment that can handle the loads you have. From VRC's to light scissor lifts, Cisco-Eagle has a solution for you. Take advantage of your vertical space by adding more floor space through mezzanines and work platforms. Whether structural or modular, mezzanines and work platforms help you gain more room by going upward. Store carton, tote and case goods on sturdy shelving made for the material handling industry. From rivet shelving to rotabin, Cisco-Eagle offers many shelving options. Move goods to the pick face with ease and have the benefit of first-in/first-out replenishment from the rear of the system. Put your system on wheels for mobile pick stations. Keep the cost of theft to a minimum with security cages, partitions and other security equipment that helps you prevent loss from theft and pilferage. Cisco-Eagle makes the most of vinyl curtains, walls, and screens. We offer protective acoustic curtains, vinyl wall curtains, high-impact doors as well as strip doors and high-speed doors. Keep production moving with the right work bench for the right job. Whether manifest, packing, assembly, or technical lab tasks, Cisco-Eagle has a work bench, station or table that's equal to the job. Keeping workers safe is priority #1 if you want a positive bottom line. Cisco-Eagle helps you accomplish your safety goals with safety and ergonomic products that help prevent accidents and injuries.